Hello Visitor, Fan or Intense lover of Digital arts! I hope you will enjoy your stay on my website. a showcase of dark and horror related artworks! Below is one of my art lectures on Youtube for the first time and the subject is "Digital Art & Expression", it's subtitled in English, please enjoy! Greetings everyone and happy approaching holidays and New Year! I've mainly been active for the last 6 months on the social media side and uploaded new works to my official facebook art page, and I regret I've neglected my own website for too long. Long time since my latest official update! Have a great summer and stay creative! Revealing Finnish excerts from my book 'Ordera - Exsilium' on its official page on Facebook also on 18th of March! I am taking print orders! Lots of other news also been happening lately! A special exhibition of my grandfather Tapio Rautavaara is held until 25th of September at the Finland's National Sports Museum at Helsinki - go see it when you have the chance. It's a beautiful showcase of his career and character as a well-known and beloved singer, athlete and movie star in Finnish history. Uploaded one of my art lectures on Youtube for the first time and the subject is 'Digital Art & Expression', feel free to share it and leave a comment on Youtube! 'ORDERA Exsilium - Maanpako' - the first book (out of four) of my longterm fantasy project started its crowdfunding campaign at Mesenaatti. me to publish the first Finnish edition of the series. Held a wonderful 1,45 h lecture of Digital Painting and Storytelling at the Agora Center (University of Jyväskylä) at Beatcon 2015 -festival , it was a really great experience and met wonderful new people from the Finnish game industry and all around the world. There is also a lot of sadness involved and my heart cried for the 12 people who were killed in Paris. It is an unbearable injustice and wrong that is hard to accept. 'Ordera' unfortunately didn't get a full publishing contract from Finland last year despite high hopes, so in this month there's going to be a full donation campaign launch, so I could bring you the perfect first batch of the first book of four called 'EXSILIUM - MAANPAKO'. I will update you further after few days and how you can help me making it happen! I will be holding a Master Class lecture at Jyväskylä on 31th of January in a huge Game & Music Event, will update more of this soon! A comic I made in collaboration with a Macedonian writer Aleksandar Stevanov has won the 2nd Award in Best Comic in the International Comic Festival " VELES 2014", which was held in Veles, Macedonia this fall. You can find a list of links and articles written of the event on this mainpage! My dark fantasy saga 'Ordera' is currently being reviewed with a publisher so before I know better you can explore its world on its renewed website! Updating more paintings within the next few days"
Updated Dark Gallery and Speedpaintings Gallery! Been so busy making new paintings that updates have been on hold, sorry for that! Have a beautiful and energy-filled springtime! 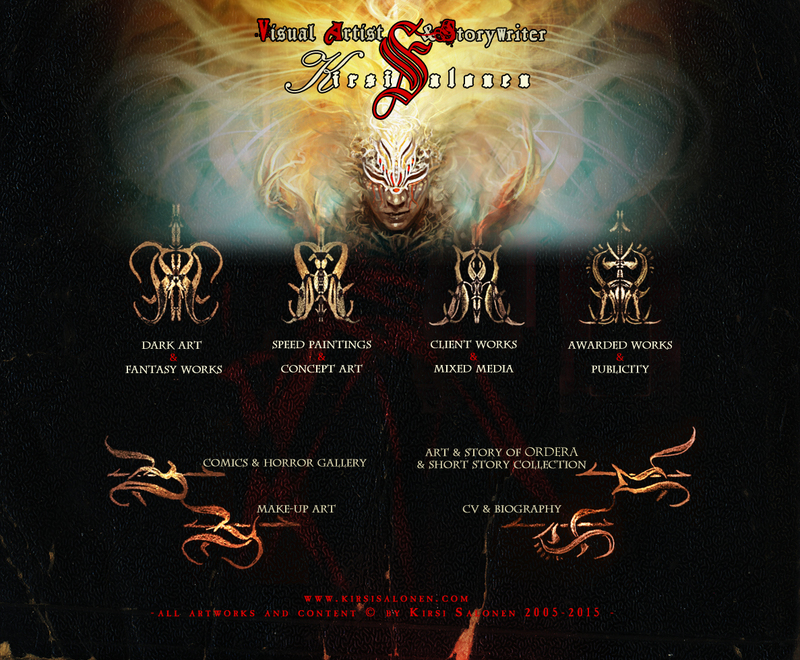 Updating my CV here after a long time and adding new images to Dark Fantasy -gallery! 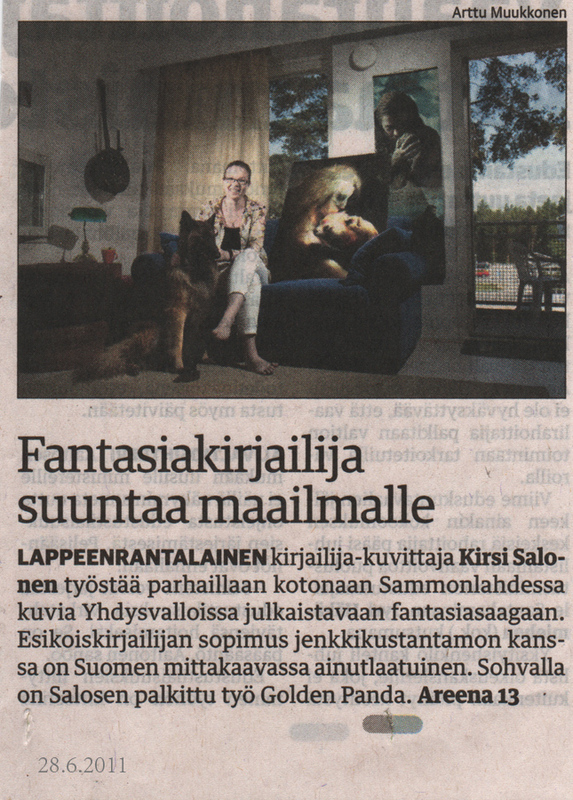 Unfortunately had to cancel an art exhibition reserved for January 2014 at TaideTupa Pikku-Selma, Kuusankoski, Finland. The publishing contract with Radical Publishing (Radical Studios) ended and now 'ORDERA' is ready to find another publishing house. The story consists of 4 parts and now I'm currently developing 4 prequel parts to complete the saga. A cover art commission for Candlewick Press is revealed at the Commissions - gallery, check it out! More updates and works will be added during July! Art Exhibition at Lappeenranta's Main Library starting 10th of April until the end of the month! Selected 27 large sized high quality prints for sale, all personally signed! On the opening day 10th of April I'm also holding a 1 hour lecture about Digital Expression at 18.00, in the Music Hall, the lecture will be recorded by Vanir Productions and will become available online (with English subtitles)! Illustrations and development of my fantasy saga ' ORDERA' restarts soon with Radical Publishing, it's been a long 2 years of wait but all is well and the first book will be out as soon as possible! 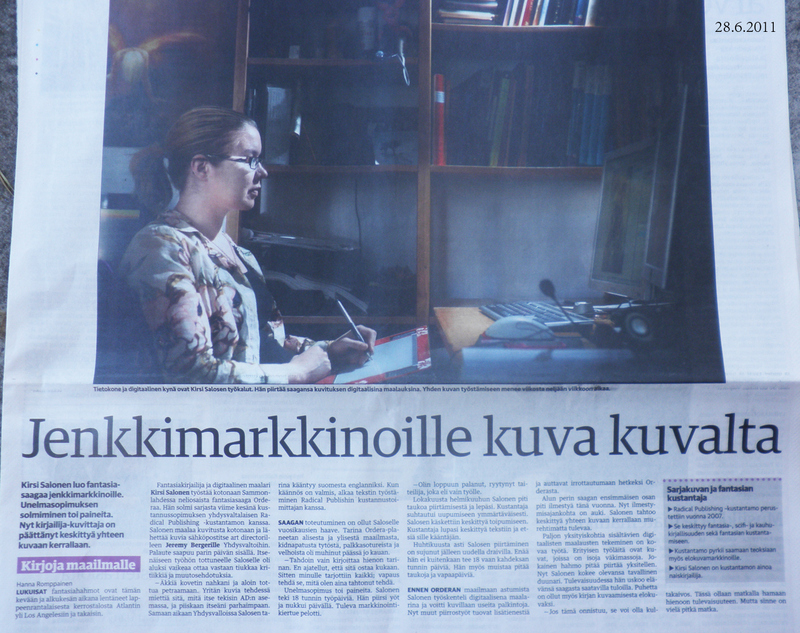 I'm holding an art lecture at Kouvola (Kansalaisopisto), in Finnish on February 13th, 18.00 - 20.15 ! It's free and you're welcome to come and listen and meet me up there and see my works, while I talk about Digital Art and the challenges and views of being a professional artist. New Gallery revealed, it's that cute BLACK DRAGON-icon!! So take a look at Works In Progress. You'll see a whole series I'm currently working on and some other unfinished paintings. 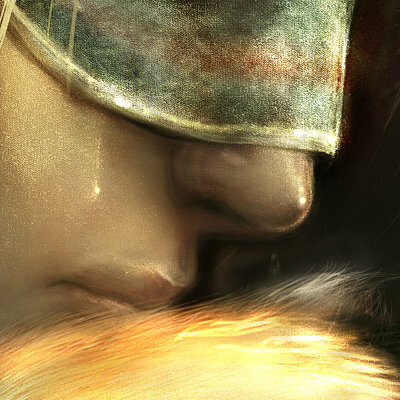 Speed Paintings Gallery updated, 21 new pieces added! Sorry, sorry, sorry for my absence! I'm updating a lot of works done this recent year, firstly today the Digital Paintings -gallery!! The London Olympics 2012 are soon on and I was priviledged to participate creating huge posters for the event working with Picasso Pictures. Thanks for your long patience and have a beuatiful summer!! Updated Poetic Library! take a look! Radical Publishing presents a massive preview of Ordera at Comic Con 2010 at San Diego convention center!! Ordera's long saga has proudly joint with Radical Publishing and the first novel 'Exsilium' will come on out as fully illustrated in 2011, hang on until then!! Digital version of the article here! Updated Commissions, Digital Paintings, Speedpaintings & Awards -categories! Added a new category: Poetic Library! More paintings will be added in next few days to also Digital Paintings-gallery! New big commission added to Gallery I! First post of '10 and I'm happy to say it's an interview for 3dtotal.com! Check it out and enjoy! One of my latest character concepts "Apis Soulraider" received an Excellence Award at 3dtotal.com! 2nd Top Artist of 2009 at It's Art -forum! Updates following during the day! Ordera's site gone through plenty of updates! Finnish versions following very soon! spending holiday, update delayed, sorry but you have to wait until the 27th day to see new stuff! Check out my Facebook -page until then, you find the link at the bottom of this page! Happy holidays everyone!! I'm updating the site between 21-23st of December so stay tuned to see a lot more new artworks and news from these last couple of months! 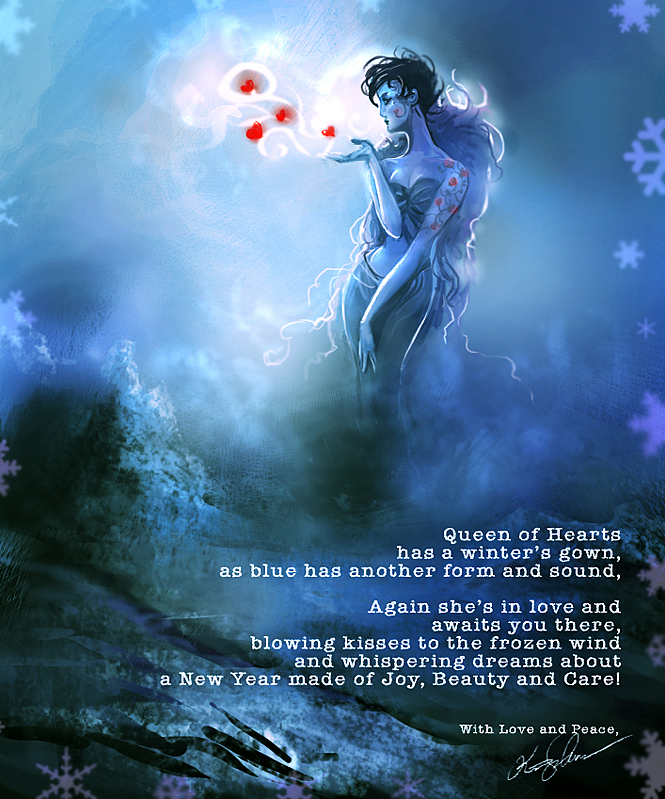 In the meanwhile, take a look at this little winterly holiday card I made for you all, enjoy it!! New exciting challenge and amazing prizes at It's Art -forum with a theme "The day we left Earth" - I'm honoured to be in the jury this time! Click to see more and enter the challenge! Updating site, lots of new images and content coming up! creating multiple concept characters to a big fantasy project called "Stain"
Now you can see my works also at Paintermagazine's Gallery, check it out! Working about putting up a new creative subsite at It's Art-forum called "It's Agora! Take a look at this teaser banner for it! Friend and amazing gifted composer Justin Lassen has been great by selecting my work "Something was left behind" as one of his favourite paintings in multiple interviews and industry's magazines such as VA Magazine, Intel Visual Adrenaline and 2D Artist - read the article here. finishing up tutorial about new painting "Marked Traveller"
- Characters now available to review!! Prologues opening soon in English! So there's gonna be lots of new features, pics and info especially about "Ordera"
The book itselfwill be out soon in Finnish and through online purchasing, but I'll do my best to add English content and information to special Ordera's upcoming website. I'm proud to be part of the artists at new online shop for digital art called Kboomm. Read about Ordera's special prologue here! I hope I can provide some more insight in English in days to come, but first it'll be presented in Finnish language through my website - so stick along and maybe there's a way to make both happen soon. Finished an interview for It's Art Magazine for their first issue coming up in January 2009, looking forward to see this special edition they plan on. Lots have happened in a month and much more still to come! Yay! I'm now a member of the Skinnis.com, visit there! Black Halo Entertainment competes at Zuda.com with comic of Kahbi (World of Chi Chronicles), artist - me of course. Flame Tree Publishing's gonna include many of my dragon-related works to it's upcoming Collection of Dragons - book. - it also will include a small tutorial of one of my latest speedpaintings entitled "Eversor"
had to remove temporarily Concept Art-section because of a certain current competition's restrictions, please stay patient. - added Close-buttons to the first page in Digital paintings, will be adding them to everywhere too as I find the time, so there's no more pop-ups! yeaah. Made a Sketchbook at my profile at Itsartmag.com, looks very cool and added lots of unseen sketches there! - updated site, added new works to Commissions and Personal paintings -galleries, finally! - Currently working with director Remington Scott, making initial concept art for his amazing modern day fairy tale screenplay "the Cockfighter". - Scheduled interview with Corel Painter official magazine for possibly August'08 issue, awesome! 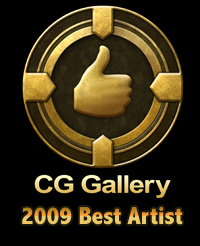 - Added 3d artist Markus Vogt's homepage to my Links-section, thanks Markus! - Interview with 2d Artist magazine completed, looking forward seeing the article! - busybusy.. managing timetables and finishing unfinished projects asap. Not so easy to be a freelancer! -- Decided to remove the Prints- possibility for temporarily, at least for couple of months. Unfortunately I don't have the freetime to manage printing and posting myself. Sorry for this, everyone! -Added details to "Prints" -section. - Scheduled interview with 2d Artist magazine to this July's issue, yay! - Finished commission painting of Alexander the Great, will be added on site shortly. - currently working with upcoming MMO online game character concepts and "Fallen Angel" comics. Created a new category "Web Tutorials". You can see fast overviews how I create different quick paintings and moods. Currently just one process viewable, but hope you find it still enjoyable. Commissions, Personal Paintings & Speedpaintings, enjoy! Still updating... Totally Friday-night stuff, lol! - I got the honour being awarded with Silver (Excellence) award in Exposé 6's Portrait (painted) category! This girl is too happy now! - Working with comic project "Fallen Angel" in collaboration with Gökalp Bayramli. - Getting ready working with Black Halo Entertainment's 2nd comic story of a complex twisted person named Victoria, so exciting! - Smirk& Dagger Games now have the piece "Din" in one of their gamecards as an illustration, check those cool games out! - Working on a remaked Alexander the Great painting as individual commission, it will be huge! rides to Eurovision, got the pleasure creating a shirt for them!